One week down and what a nice week it’s been! I’ve realized that making the commitment to spend at least two hours in the studio on my days off means I’m prioritizing sewing and claying over other things. It’s a good thing. It feels very luxurious somehow. I’ve sewn up 3.25yds this week (running total 9.25yds), adding two dresses and a skirt to my tiny work wardrobe. 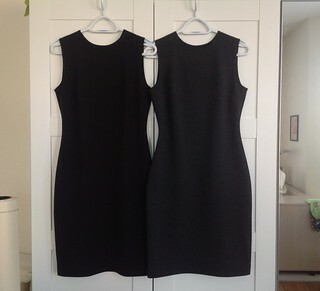 The dresses are from my TNT sleeveless sheath (M6355). They take me three hours from flat fabric to finished dress. The skirt pattern is also a TNT one, adapted from M6355 to approximate the idea of Pamela’s Magic Pencil Skirt. 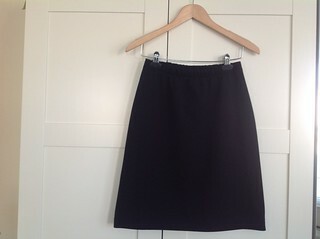 It is not an A-line skirt, despite looking like one in this picture. From the hip down, it’s cut exactly the same as the two dresses. I think it’s the elastic that’s distorting the look on the hanger. Please excuse the hanger pictures. I won’t even entertain taking pictures of these pieces on me until the outdoor temperatures are in a reasonable range (below freezing for days on end does not qualify in my book). Both fabrics are ponte. The black one came from Michael’s Fabrics and the heathered dark gray from Emmaonesock. It’s hard to tell the difference in this picture but in real life the difference is obvious. I didn’t make a skirt in the gray because I thought the fabric might make a nice jacket too. So I’m keeping the remaining 1.75yds for that. I hope these fabrics wear well and don’t seat out. They are wonderful to sew and the perfect weight – not too light, not too heavy. I recently moved my clay table into the sewing studio so now my hobbies share one space. This is a good thing. Having two separate spaces wasn’t working well for me. I still have some work to do with reorganizing storage to accommodate clay supplies, tools, and binders full of tutorials. This week I tackled scrap clay and organized it nicely in a plastic box. Then I made four bracelet bases using up some of it. I’ll sand them tonight. The plan for the next few weeks is to work on the techniques in Dan Cormier’s online class Single Slice Mokume – probably lots of samples, different color combinations, and maybe even a finished piece here and there. We’ll see how that goes. And that’s all I have right now. Before I made the teal jeans, I was still on the red kick from earlier this year. And I made this red top. It was the first piece of my winter 6-PAC for which I never made a real plan. I vaguely remember thinking about three tops and three skirts, but this red top is as far as I got before switching gears to sewing jeans. Lately I’ve been noticing trim and piping and similar details on my inspiration garments. 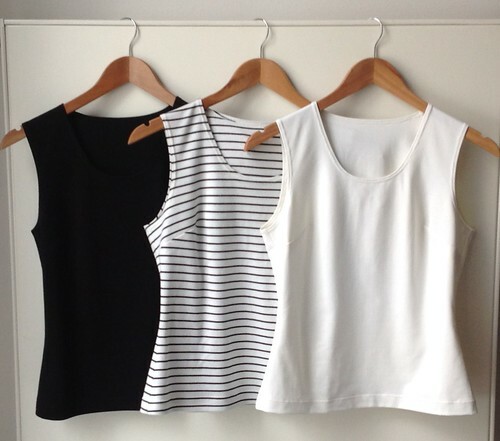 And I have equally been noticing their very obvious absence in my own closet. The red top was my first step towards remedying this. The pattern is my TNT M6355 again and the fabric is a fabulous wool doubleknit from Michael’s Fabrics (years ago) that sews like a dream. 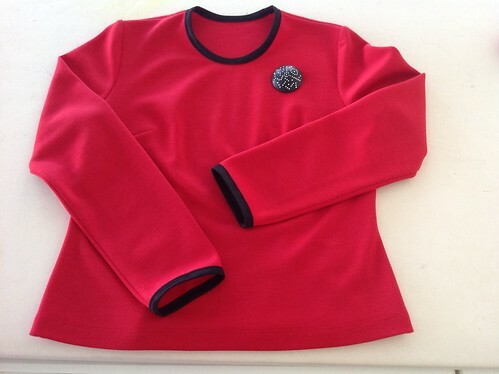 I used black foldover elastic for the sleeve hems and neckline. It looked pretty “trimmy” already compared to my usual creations but when I put it on, it seemed to want more. I played with one of my samples, and I think small black-trimmed pockets would have been perfect, you know, Chanel-style. Except, this is not a jacket, but a pullover top. So no pockets, thank you. 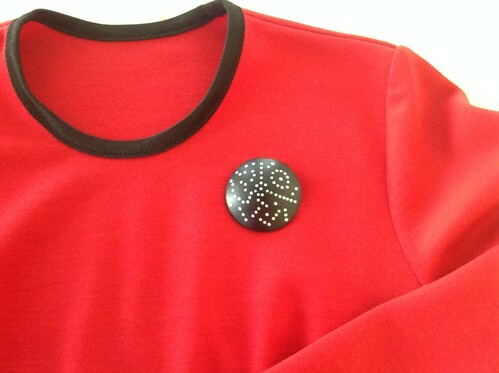 Instead, I thought, how about a brooch? And so I made one with polymer clay. I wasn’t quite sure what I wanted but I knew it should be mostly black. So I made the dome and then fairly randomly poked it with a small stylus. It was meant to be a sample to try the back-fill technique so I wasn’t going for any particular pattern. After curing, I back-filled the holes with white polymer, and cured again. After sanding, the surface is smooth and solid. I really like it. And it adds the touch of black that the red top needed. 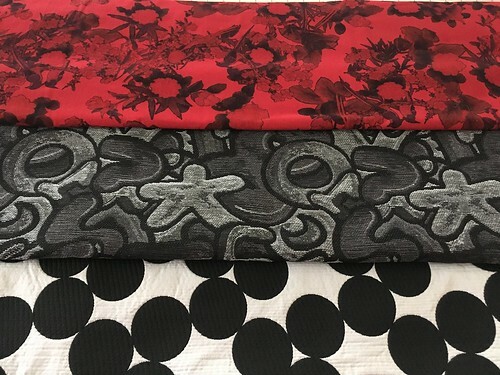 Above are the three fabrics for skirts. I figure since these fabrics are the outfit star kind, they can be worn with solid-colored turtlenecks all winter. All three are from Marcy Tilton. Only a yard of each, enough for a skirt. They’ve been sitting on the shelf, patiently waiting for me to realize once again that I can have a fitted top or a dartless one, but that fitted and dartless is really not in the cards for my body shape. Well, they’re up next, hehe. Have you guys watched the Craftsy class Decorative seams with Katrina Walker? It’s been sitting in my queue for a while and I finally watched it while knitting the red Viajante. Seriously, knitting and watching Craftsy is awesome! Anyway, I digress. McCall’s 6355 – not easy to recognize like this, is it? Katrina’s enthusiasm is totally contagious. I mean, I’m knitting and watching and in my mind, I see dresses with all sorts of piping and trim details that I could make. The pattern that comes with the class is Vogue 1329 – a Kay Unger number that looks great on quite a few sewing bloggers. I cut up the pattern sheets and ironed them, and then dithered about making a muslin. In the end, I decided to use my TNT dress pattern (McCall’s 6355) instead. I really just didn’t want to start from scratch. Which is kind of funny because the other day I read Beth’s blog post where she basically says for her, starting from scratch means drafting a new detail and it’s easier to take a new pattern and fit it. For me, it’s the other way around – I’ll hack my TNT pattern six ways to Sunday but if I have to start with a new pattern, well, let’s just say all kinds of stars would have to line up just so. I used some leftover bias tape to see how these lines would look on me. My approach was very scientific, hehe, standing in front of the mirror in the red dress and pinning the bias tape until I thought it looked right. That was also when I figured out that the armholes would need the contrast trim because it just looked odd without it. Then I put it on the dressform to make it easy to take measurements and such. The pattern work is really simple – just the front yoke and what is essentially a princess line below the yoke on the left side. I also raised the neckline to get a better proportion for the yoke. You can just barely make out the white trim pinned to the left armhole. The fabric is black Sophia double knit from Vogue Fabrics and white Swiss 4-way stretch from Gorgeous Fabrics. The end result is quite sporty looking in my opinion. Totally not what I was expecting – it just didn’t look sporty in my head until I put it on when it was finished. I like that it works well as a summer dress – it doesn’t require a cardigan or anything to give it interest, the white trim does that job. I’m also going to try making the front yoke and the left front panel in a contrast color, like the pattern envelope shows. And that’s all I have about this dress right now. Next up is a little cropped polka dot cardigan. See you soon! So the day after my previous post, I injured my left hand and then re-injured it again in the same spot a week later. With a lot of babying, it’s been slowly recovering and I have done only a bit sewing. Not much, but better than nothing, right? This is my trusty M6355, shortened to the waist. 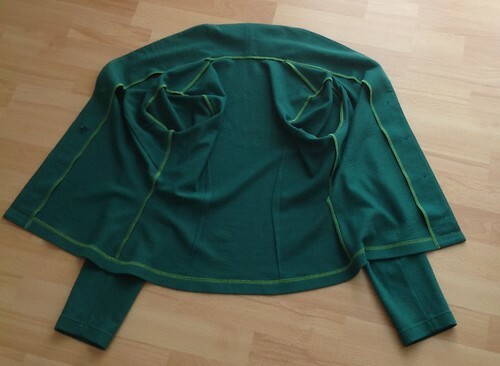 I cut the front straight down from the shoulder point and added a 2″ neckband. It turned out more formal than I had planned so I played with it a bit. Really, this formality gets quite frustrating when you think you’re going to end up with a super casual garment and then you don’t. Anyway, at one point I turned down the band, like you would a collar, and realized that it made it look much closer to the original intended effect. So in the picture above, the band is tacked at the hem and safety-pinned at the center back because I wanted to wear it out of the house to see how it would feel. I really enjoyed wearing it although I see in the pictures that maybe I could play with eliminating the dart somehow. My mother-in-law also suggested rounding the front edges at the hem. That will make it a bolero though, won’t it? I feel some inner resistance to the bolero, not sure why. (Because I don’t want to look like a toreador?) More so the word than the actual shape, I think. I’ll have to try it. I did make two other quick garments in the last few weeks, a pair of pants and a skirt, and I’ll tell you about them next time. Well, it has taken me a while to get back to sewing. I have a good excuse for February (out of town all month) but how March got away from me, I really don’t know. Anyway, it is high time to get cracking on this SWAP collection if I want to finish it by the end of April. 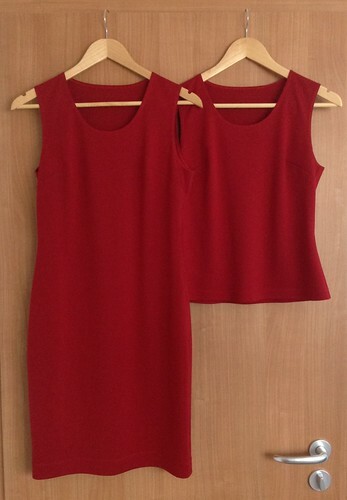 To that end, I sewed up a top and a dress, both red, both sleeveless. 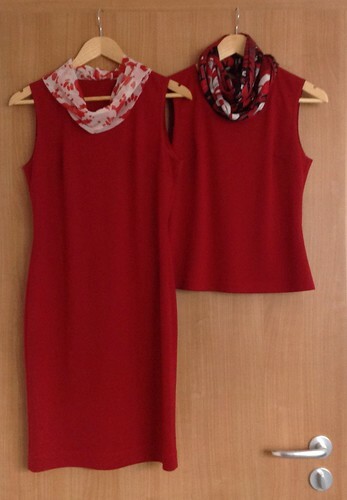 Same fabric for both – Sophia double knit in Scarlet. It turned out to be a darker red than I thought it would be but very wearable, and less in-your-face than my usually preferred screaming bright red. The pattern for both is my TNT that started out life as M6355. I just love it. By now, I can sew this up without much thinking or elaborate planning, having worked out the best stitching sequence in previous versions. I left the necklines plain, just a simple scoop, because I plan to wear scarves with both of them, as in the picture above. I will have to look through pictures to verify this, but right now my theory is that I prefer to wear necklaces with collars, and scarves with no-collar necklines. If this hunch turns out correct, then that will inform my future capsule planning. I hope you all are sewing up a storm. See you soon! I’ve been down with a wicked cold but that hasn’t stopped me from sewing. In between the gallons of tea and regular doses of cold medication, I was thinking and sewing spring. Ha! Take that, silly cold! This is yet another adaptation of my favorite pattern, M6355. I just love it. The fabrics are black Sophia double knit, white Swiss 4-way stretch (from Gorgeous Fabrics – it’s a fabulously smooth nylon/acetate/lycra jersey), and the striped knit is a cotton interlock that’s been waiting patiently in my stash for years. I took the pattern for my colorful dresses and shortened it to about the high hip level. I left off the collar and just turned the neck edge under, topstitching with a twin needle. I really love how easy it is to use a TNT pattern. Sometimes I wonder if I’ll ever use another top pattern again. 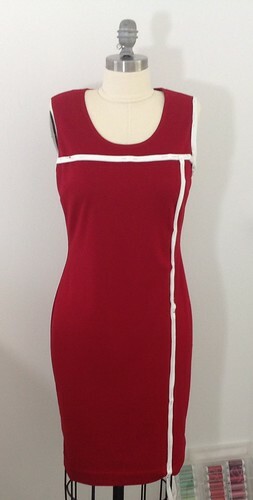 Up next is the red top and red dress. The fabric is in the washing machine as I write this. I hope to have pictures to share by the end of the week. Back in April I posted about my black and lime green theory. It involved a simple sleeveless dress and a coordinating collared cardigan. That was the hypothesis anyway. But the more I worked with the four pieces, the more I felt like something was a little off. It took a while to put a finger on it but I finally realized that I didn’t care that much for the open neckline on the dress when worn alone. So my second hypothesis was born: collared dress and collarless cardigan. I closed up the neckline just a bit from the really wide and deep tank top style, and added a foldover stand-up collar. This is really pretty easy – it’s right about 1.5″ finished so I measured the neckline and cut a 7″ strip on the crosswise grain to that measurement. The 7″ allows room for turn of the cloth and seam allowances. I actually made a paper pattern piece to make cutting out easier. The pattern is my good old TNT McCall’s 6355. It had the length, side seam shape, and armholes already worked out so the neckline was the only alteration. After making the first one of these to test the neckline, I promptly made it again in two other colors so now I have it in lime green, bright kelly green, and turquoise. I took all three on our trip to Florida and practically lived in them there. One piece dressing – it just doesn’t get any better. To stay warm in the arctic A/C, I carried a black cropped cardigan. I had originally planned to make a black collarless cardigan as part of this collection but I ran out of time before the trip. So the old RTW cardigan would have to do. It was perfect for my needs. I’ll save the word soup about it for when I have more pictures, should be in the next few days. 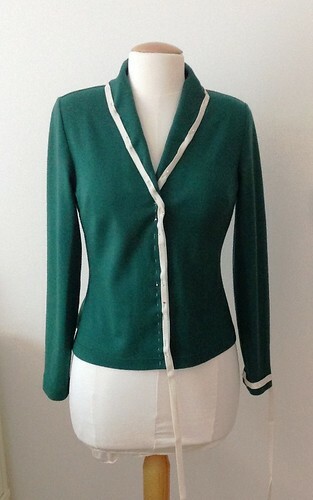 I made two sets: one in lime green, the other in black but with a contrasting collar and cuffs on the cardigan. All four pieces are from M6355, which by now is a TNT pattern for me. I used Sophia double knit for its ease of sewing, care, and wearing. No lining, no zippers. This is still a theory that needs to be tested, but if this really is THE formula for me, then future versions will likely be lined and possibly made in drapey wovens. And for cooler weather, the dresses might have sleeves. We’ll see. Spring came early this year (or more like, winter never really got started here) so I expect to have a lot of opportunities to test my new uniform. In the pictures above, my absolute favorite combination is the green dress and black cardigan, so I think I will start with that and make a few more sets in the next few weeks, for more color options. It’s funny, actually, because I expected to prefer the one with the green cardigan and black dress. Something about having a bright color on the bottom half of the body just didn’t seem right. But to my surprise, it looks good both in real life and in the pictures, so I’ll stick with it for now. Here’s the project that helped me out of the funk. It’s a shawl-collared cardigan, the idea for which crystallized after a recent consultation with John Kitchener (more on that in another post). The fabric is a malachite-colored wool jersey that’s been in my fabric stash since 2006, waiting patiently for the right project to come along. It’s an absolute pleasure to sew and press, just like every other wool jersey I’ve ever tried, and comfy to wear. I really need more of this fabric, in all kinds of bright colors. I used my knit top TNT McCall’s 6355 and added a shawl collar. I had originally drafted a separate collar into a slightly curved neckline and a cut-on facing, but I didn’t like how the finished collar looked where it met the front edge. So I went back to the drafting table and added a regular shawl collar onto the front (this requires a separate facing). In the picture above, you can see the original TNT front under the new shawl-collared front – the only changes are at the neckline and front edge. I used Armstrong’s directions except for moving the neck point (sheer laziness as I already had the back piece cut out and didn’t feel like tracing and cutting a new copy) and made the collar wider, per previously established preference. For the facing, I took into account the turn of the cloth, adding to the collar and subtracting from the front edge. Although I can see a lined version in the future, I didn’t line this one. I wanted it to feel sweater-like. Also, because I didn’t have matching thread and over here thread costs twice as much as stateside, I only bought one small spool for the stitching that would show. All the serging inside is in lime green. None of the lime green shows when I wear it but it makes me feel good to know it’s there. There will, of course, be a lime green version coming soon. I know you knew that. What I realized as I tried it on in front of the mirror, is that this fabric clings to my bra. It wasn’t apparent with the dress because I wore a slip under it. Now, this is a seamless T-shirt bra made of some smooth material that has never attracted any clinging. But this fabric, I tell you… It wrinkles and clings and shows every little bump. Good thing I don’t have any more of it. 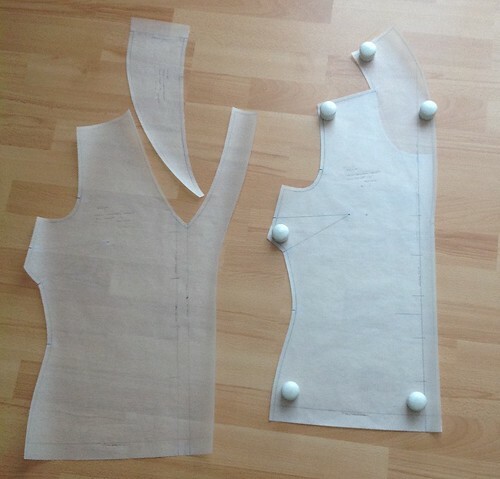 At any rate, I am happy with the alterations and ready to make more tops with this pattern. 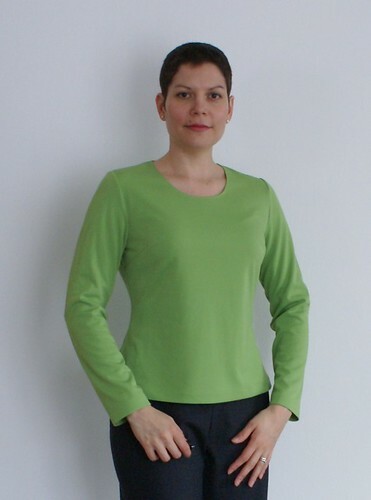 For this green top, I used the scoop neckline. On future versions, I plan to add a loose turtleneck or cowl collar. The pants are a total frankenmix of my old TNT (from an old Burda WOF) and Butterick 5941. 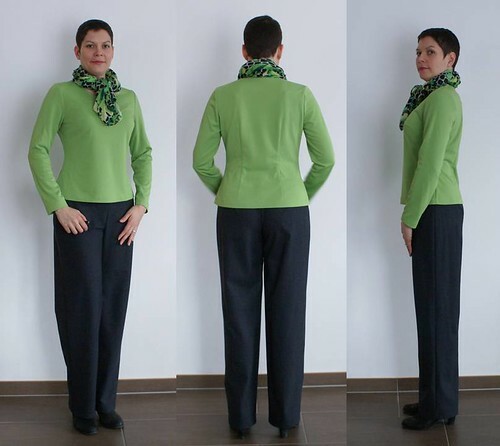 I wanted the comfortable waist-to-hip fit of the Burda and the narrower legs of the Butterick. I think they turned out reasonably well. The look good in the front and from the side. I see something on the back view that I’m not sure what it is but I’m not planning to make any changes until I’ve made this pattern again in another fabric. The fabric is a lovely wool/cashmere blend from Banksville Fabrics. I was going to use a simple grosgrain ribbon finish at the waist but when I basted it in and tried on the pants, the waist was just a little too big. So I had three choices: I could take in the side seams to make it just right, I could leave it alone and not worry about it, or I could try some elastic. Generally, I reserve elastic waist for pajamas but here I thought I had a good fit everywhere and just needed a little taken in at the waist. And then I would also want more room as soon as I ate lunch. The elastic would provide both. I had to rig it because I hadn’t really seen anything like it before. It’s basically a grosgrain ribbon on the inside to form the casing, elastic enclosed in it and sewn to the ends of the ribbon. Then I tried them on and while I liked the effect, I was worried that there might be too much tension on the zipper. So I rigged the button and loop closure. Both are sewn through the ribbon and the elastic, but not the shell fabric so they’re invisible from the outside. The next night I bought the Taunton e-book Easy Guide to Sewing that shows a really nice invisibly elasticized waistband finish. I’m going to try that next.